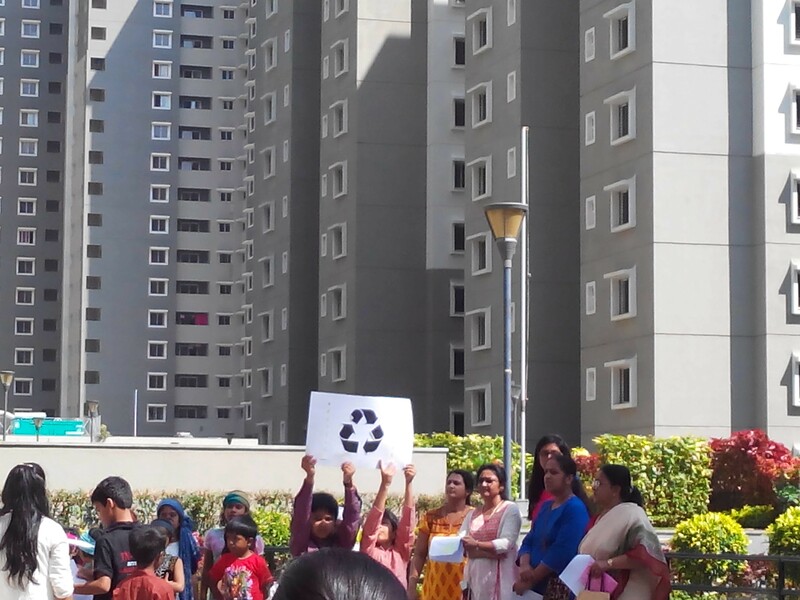 Little children questioning the human rights violations being heaped on Mandur by the people of Bengaluru, expressing solidarity towards the aggrieved lot and taking a pledge to lead a life free from landfills isn’t something we get to see during a children’s day event. But this is exactly what happened today at Sobha Ruby Platinum, a cluster of high-rises located on Tumkur Road. The complex already has basic waste segregation and composting activities in place. But the residents’ management committee is willing to go the whole hog and transform the living space into a waste-free zone. Not satisfied with the current compliance levels, the volunteers decided to launch the campaign formally and drive home the message through younger citizens, some as little as 5-6 years old. A three-part skit performed by them did all the trick and held their audience rapt. Equally heartening to see was the management committee’s seriousness. In my view, a committee studded with a few good leaders is all it takes to make the change. Else, it ends up becoming a maintenance committee. Sobha Ruby Platinum need not worry about this aspect of their existence at least. All they need to do is be part of the green voyage. The destination isn’t far off. This entry was posted in Endlessly Green and tagged Mandur landfill, Sobha Ruby Platinum, Waste segregation at source. Bookmark the permalink. ← Community composting method-3: Byobins, these two make a right pair! Children becoming aware of human rights. Most heartwarming. Yay! hello savitha your posts are inspiring , heartening to learn about sobha ruby . we at purva are also gearing up to start.